If Nagoya area fans of Irish music said "This is our place! 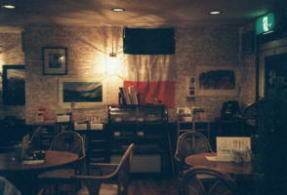 ", they would almost certainly be referring to Cafe Caledonia in Kasugai. Regular live performances,practice sessions for Celtic music beginners, and other events have been and will continue to be scheduled at Caledonia. If you're looking for a place whe replans can be made and new things tried, that is Caledonia's forte.